The Canary Party is a fast-growing movement of parents, doctors, scientists and everyday citizens who want to put a stop to the systematic poisoning of the population by drug companies, vaccine manufacturers and other corporate pushers of toxic substances that damage humankind (and the planet). Click here to read the position paper of the Canary Party. You’ll find that it is based on the scientific “precautionary principle” as well as fundamental parental rights and individual responsibilities. In summary, the Canary Party seeks to reveal the truth about how we are all being poisoned by unethical corporations and then find constructive ways to stop the poisoning and end the human suffering caused by it. Regular readers of NaturalNews will find these principles to be quite familiar, as we share these same goals. I plan to work with the Canary Party in the near future to find other ways we can help support their cause for humanity. All of these substances are toxic to human biology when injected. There is no rational doctor or scientist in the world who can say they believe injecting infants and children with mercury, formaldehyde, MSG and aluminum is somehow “safe,” yet doctors inject children with these substances every single day in the form of vaccines. At what point will autism reach 1 in 10 children? It’s not that far off (it’s already over 1 in 100 children born today). If this level of disease were caused by anything other than vaccines, the CDC would have long declared it an epidemic and tried to push a vaccine for it. But because autism is linked to vaccines and mercury, the CDC downplays it and ridiculously pretends children aren’t being harmed. The FDA plays the same game of denial, hoping no one will notice as the condition multiplies to the point where one day potentially every fifth child in America will be autistic after receiving the hundreds of “required” vaccines that will be mandated in the near future. We are talking about the downfall of a nation here, folks. 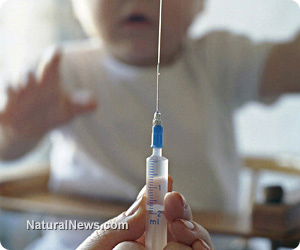 If this vaccine holocaust is not stopped, America will not survive. No nation can survive the collapse in the health of its citizens. Injecting mercury into the population of America is just as idiotic as feeding the citizens of Rome drinking water laced with lead. Many historians say the lead poisoning of the citizens of Rome exacerbated its downfall. Today, vaccines are strongly contributing to the same sort of downfall of modern civilization. To learn more on this issue, read my list of 10 startling facts about vaccines the CDC and the vaccine industry don’t want you to know.